Lance Armstrong doping: Will the latest investigation prove his guilt or exonerate him once and for all? Will the latest doping investigation prove Lance Armstrong’s guilt or exonerate him once and for all? Lance Armstrong at the 2005 Tour de France in Paris, France. Armstrong is under investigation of doping by the USADA. Photograph by Robert Laberge/Getty Images. On the surface, it may seem that Armstrong is making a plausible argument. In February, the U.S. attorney’s office in Los Angeles closed its two-year investigation into Armstrong and doping without bringing any charges. 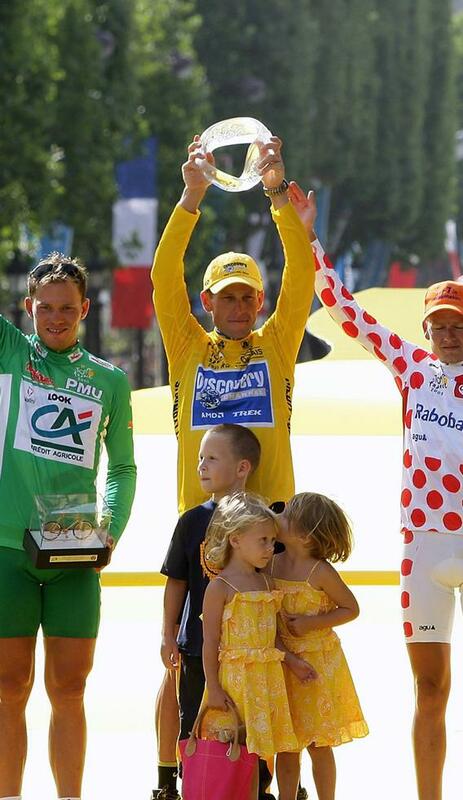 Now, just four months later, a different body has piled on in an attempt to take away his yellow jerseys. But the Constitution does not guarantee the right to compete in professional sports. And in January 2011, Armstrong claimed that he welcomed the USADA investigation: “I look forward to being vindicated,” he said. The fact that the feds dropped the case earlier this year did not equal vindication, he told Men’s Journal in a recent interview. “In order to beat them you’d have to go through a trial and there would have to be a verdict,” he said. Now, at last, he has the chance to prove his innocence. The bulk of Armstrong’s career—the years between the early 1990s and his 2005 retirement—coincided with a golden age for doping in the sport, at a level not seen outside the Eastern Bloc circa the 1980s. Riders began using the red-blood-cell booster erythropoietin in the early 1990s. When a test for EPO was introduced at the Sydney Olympics in 2000, they switched to blood transfusions, a time-honored (and banned) practice dating back decades. Major scandals, including the massive Operation Puerto affair in Spain, not to mention Floyd Landis losing his 2006 Tour de France title, took out many of the top contenders of his day. Armstrong’s contention that he’s being singled out is the exact opposite of the truth: Thus far, Lance is one of the few top riders from cycling’s doping era to remain unscathed. The singled-out claim also doesn’t consider that USADA has charged key Armstrong staffers, from doctors to his longtime personal trainer Michele Ferrari (whom I profiled for Bicycling in 2006) to his team director and confidante, Johan Bruyneel. Doping in cycling is, or was, a structural problem, handed down from generation to generation and (on some teams) enforced by team management. If USADA’s charges are true, that certainly seems to have been the case on Armstrong’s cycling teams. So there’s a good reason Armstrong was the only rider charged: He was the boss. The team was organized around him, led by him, and dedicated to helping him win the Tour, period. His teammates, several of whom have apparently told USADA that they doped, did so to help him win—and to keep their jobs. Their admitted cheating enabled him to earn tens of millions of dollars. The alleged doping was not just limited to EPO. They’re also accused of using testosterone, which Ferrari is said to have mixed with olive oil to let the athletes take it orally; they called it “oil.” Several riders also told USADA that between 1998 and 2007, Ferrari developed “training plans dependent upon blood transfusions.” (Armstrong allegedly kept transfusion equipment at his home.) The riders also said that Bruyneel and team doctors made human growth hormone available. This allegedly institutionalized, systematic approach is a long way from Jose Canseco injecting himself with steroids in a bathroom stall. How should Armstrong defend himself? One obvious PR maneuver was suggested, ironically, by one of Armstrong’s accusers, ex-teammate Tyler Hamilton. Last May, Hamilton told Hamilton told 60 Minutes, “He took what we all took—the majority of the peloton.” In other words, everybody was doing it. But does the fact that so many of his contemporaries have been sanctioned for or suspected of doping mean that we shouldn’t care if Armstrong cheated? No, it doesn’t. There are two reasons why we should care. First, as Garmin-Barracuda team director (and ex-Armstrong teammate) Jonathan Vaughters explained to me once, performance-enhancing drugs help some athletes much more than others. Rather than leveling the playing field, drugs actually make it more distorted. Second, “everybody” wasn’t necessarily doing it. Not everyone said yes to the proffered syringe. There are many cases in which young American riders went to Europe, hoping to make the big time, and were inevitably offered the opportunity to “go to the next level” or “get on a program.” Some said yes, but lots said no, even if it meant giving up on their dreams. “It was available, if I wanted it,” a former low-level Armstrong teammate once told me, referring to performance-enhancing drugs. He didn’t, so he dropped back down to domestic U.S. racing, the equivalent of going from the Yankees to the Lancaster Barnstormers. Despite public perceptions, doping is far less prevalent in cycling than it was just five or six years ago. New, comprehensive testing regimes will catch all but the cleverest cheaters, and several teams now carry out their own stringent anti-doping measures. One of those teams, Garmin-Barracuda, recently had a rider (Canada’s Ryder Hesjedal) win the Giro d’Italia—a notoriously difficult feat for a foreigner. English sprinter Mark Cavendish won dozens of races for another “clean” team, HTC-Columbia. That brings us to the most curious and potentially damning lines in the whole letter. Most of the allegations focus on 1998-2005, when Armstrong rode for the U.S. Postal Service and Discovery Channel teams. But according to USADA, Armstrong’s test results from his comeback years of 2009 and 2010 are “fully consistent with blood manipulation including EPO use and/or blood transfusions.” If true, that means that even as “everybody” stopped doing it, Armstrong kept right on going. Even if Armstrong loses his case with USADA, he could appeal to the Court of Arbitration for Sport, which would assign a three-person panel to decide his case. Those hearings are normally closed, but he could choose to open his to the public. Maybe he should: It’s the chance he’s longed for to finally prove his innocence. On the other hand, his best strategy may be to keep as quiet as possible. It’s possible the public is so sick of doping allegations that nobody will pay attention as his career goes on trial.